A couple of weeks ago, I presided at my first Book of Common Prayer Eucharist. Its a lovely service and, like many across the Anglican Church of Canada, our is attended by a small but faithful group of people at 8 o’clock in the morning. In preparing for this service, there were a few “extra” details that were really important for me to have alongside that morning. The red prayer book I used belonged to my mother. In it are small handwritten notes, instructions she had no doubt penciled in to assist her in serving at the table in the parish where I grew up. I continue to use this BCP for myself, though it is a little small to consistently use for presiding at services! 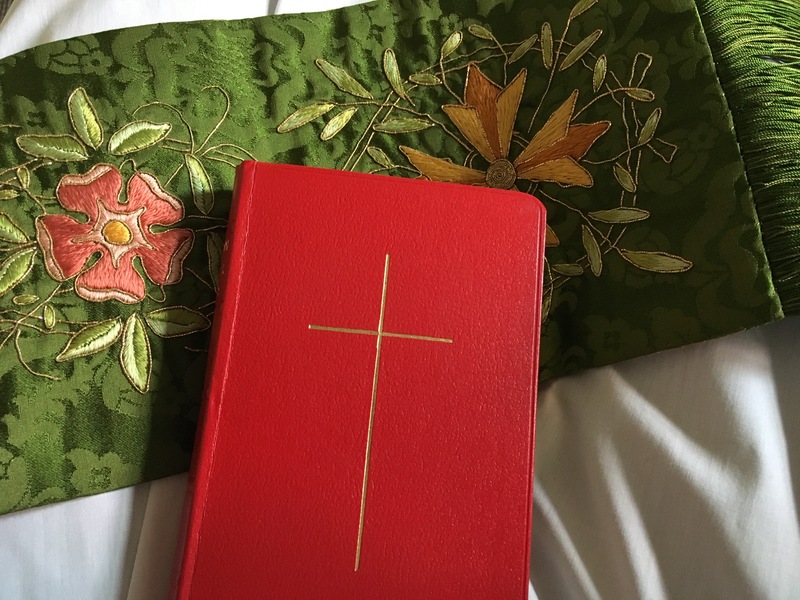 The green stole I wore for the service was an ordination gift last year. It was given to me by the wife of a retired, and now sadly deceased, priest; a couple I got to know when attending the Cathedral in Victoria. The stole is a stunning piece of embroidery, but its meaning goes deeper than its beauty. The stole belonged to Archdeacon Bob MacRae, former rector of the parish I now serve and the first secretary of the Primate’s World Relief and Development Fund, where I currently volunteer as a board member. Bob, and his wife Sue, have both been supporters of me pursuing ordained ministry and it is an honour to wear his stole. These two items used are a reminder of two faithful people, now passed, as well as reminder of the long tradition I have been called to participate in. For me they are symbols of the timelessness of faith alongside the call to make old things new as we seek to serve God in a generation. They ground me in my past and propel me towards the future. 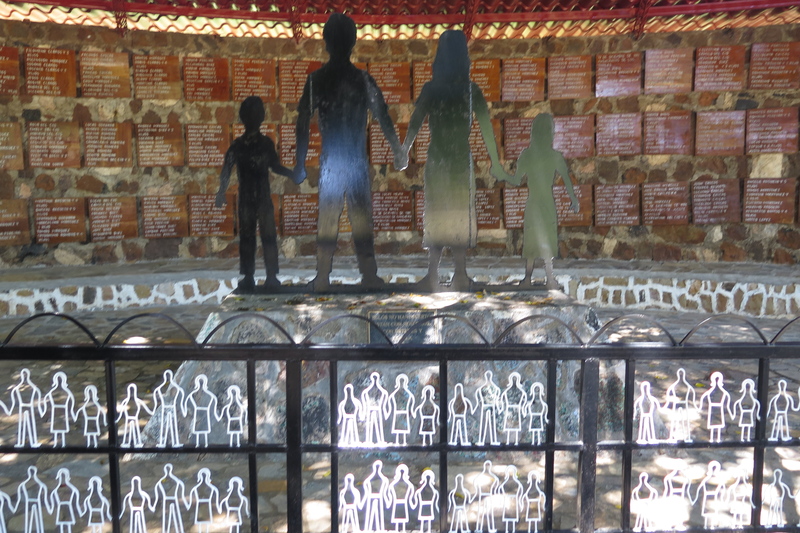 The largest massacre of the conflict in El Salvador happened in El Mozote on December 11, 1981. 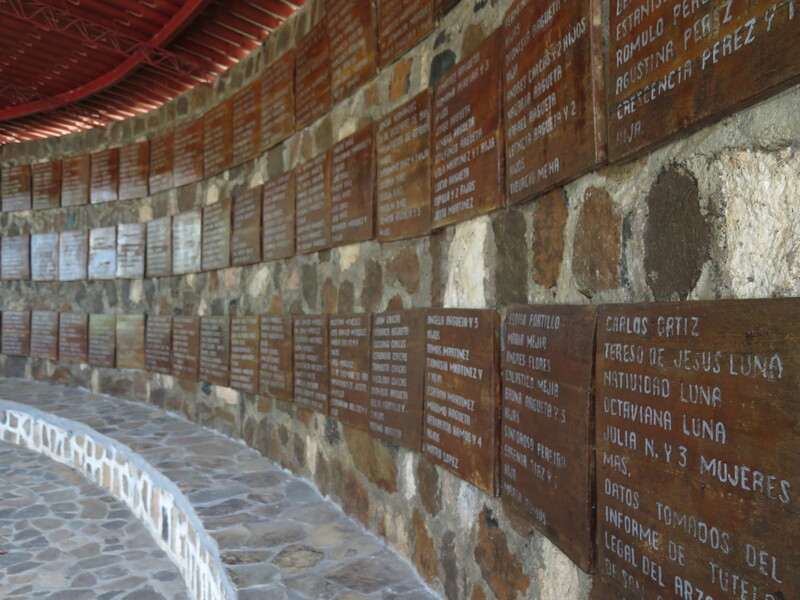 Reports vary, but anywhere from 750-1000 civilians were killed by the Salvadoran army that day. 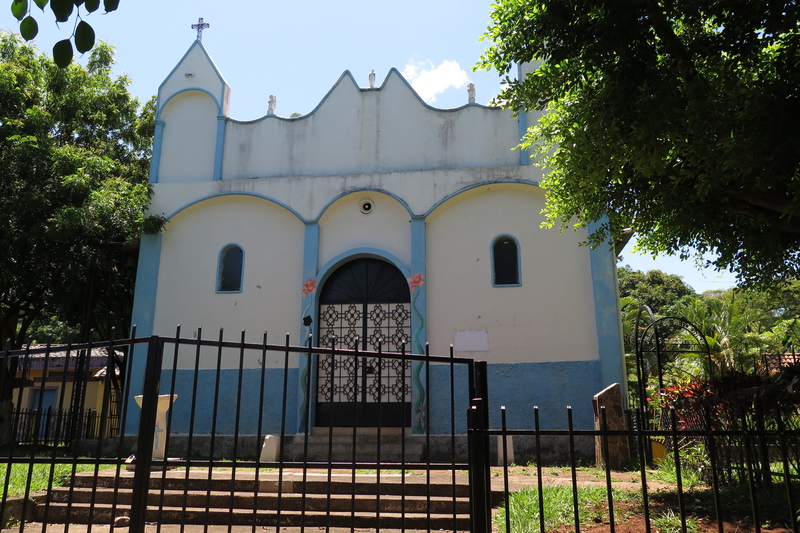 El Mozote is a small town near the border with Honduras. There are a few homes around a square, a small store, a big tree with the open-air market, and a church on a small rise at the base of one of the surrounding hills. The church is simple – whitewashed with blue trim. There is no steeple or tower, just two small crosses on the outside corners. Whether or not the church looked like this 35 years ago, I do not know. But there has always been a church. The church is surrounded by a concrete retaining wall and a short iron fence. While the gate is closed today, I can see another gate, made of iron in the shape and colour of a sun with rays and rainbow, leading into the garden beside the church. Over this image is the words, “Jardin de reflexion los inocentes” – The Garden of Reflection of the Innocents. Immediately what springs to mind is the Feast of the Holy Innocents, which we are commemorating today in the chapel at Huron. This is the feast where we remember those children massacred by King Herod when he was hoping to kill the child Jesus. But that isn’t entirely what this garden is commemorating, though it may be a reference. 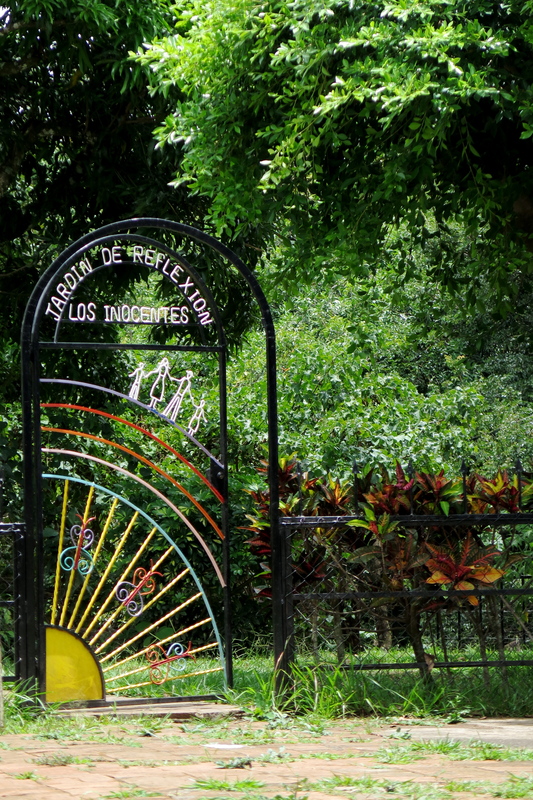 This garden is commemorating the massacre in El Mozote. No one outside of the immediate department in El Salvador really believed that there had been a massacre of civilians of this scope in El Mozote. The army took great pains to hide it from everyone. Yet years later when they finally began to excavate the site, they found the bones of approximately 150 children buried in this space beside the church. One hundred and fifty innocent children massacred in one place. With tears in his eyes, the brother of the lone survivor, Tomas, told us of how his sister Rufina was carrying her eight-month old baby and had her other children by her side that morning when the army rounded everyone into the square. First the men were brought into the church, interrogated, and killed. Then the young girls were taken into the hills, raped, and buried. Rufina’s baby was knocked from her hands by the soldiers who then picked it up, tossed it into the air, and “caught” it on the end of their bayonets. Entire families were wiped out in this massacre. Lives changed – and taken – in an instant. Soldiers set fire to all of the buildings in the village, with the bodies piled inside, hoping to remove all evidence of what they had done. I asked if justice had ever been served. They said no: those who ordered the massacres are still serving in the Legislative Assembly and until they are no longer around to block the process, they cannot seek justice. God is here and is making all things new. We are participating in that renewal of the earth. Awful things are still going to happen, unfortunately, until the new heaven and new earth becomes reality. Until then, we continue to hope and pray and work to make it our reality. I am currently in Toronto for the board meeting of the Primate’s World Relief and Development Fund. This morning our Executive Director led us in a theological reflection that included, in part, a reflection on the life that can come out of death. Twelve years ago this morning we lost mum. 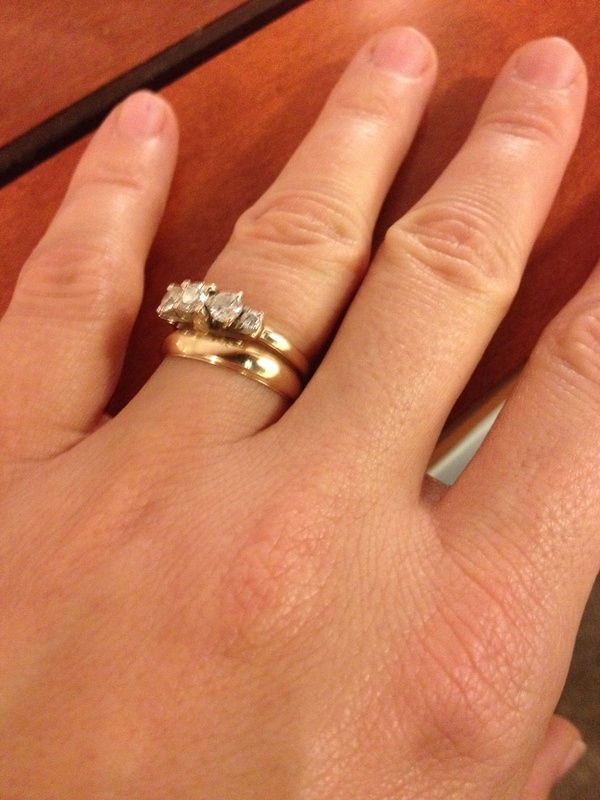 One month ago this weekend, I was given her wedding band and a promise. Out of death has come new life. Amen.